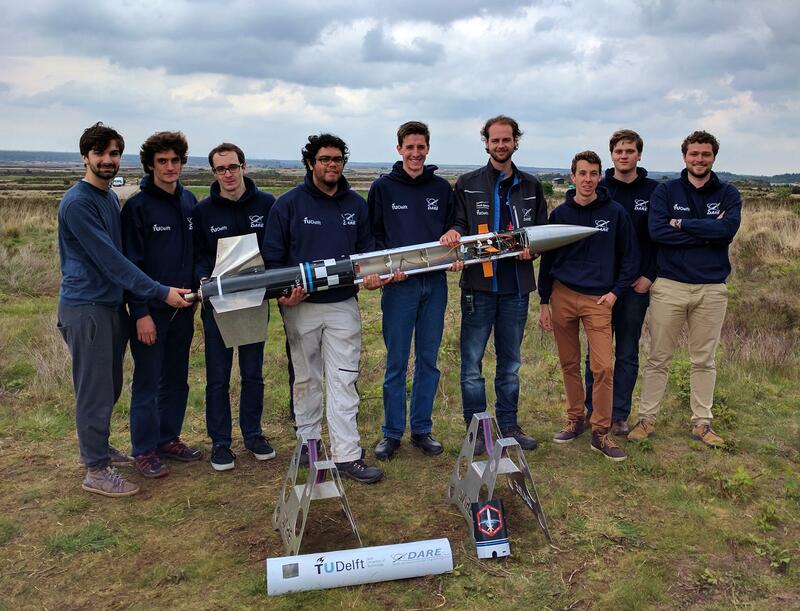 On Friday 20th of May 2016 DARE wrote history when the Advanced Control Team (ACT) successfully launched the first actively stabilized rocket of the society! The objective of the launch was to control the rolling motion of the rocket, and therefore performing a complete integrated flight test of the V7S rocket, which includes testing of the hardware, flight control software, and electronics. After the unfortunate failed attempt in the first week of April in Borris (Denmark), the team pushed their work forward to guarantee a complete success in May during the SRP Launch Day 2016 at ASK ‘t Harde. The team was scheduled in the final launch window, since the rocket needed to be launched from a reallocated launch pad, due to range safety precautions. With great help from T-Minus Engineering, the ACT used their hydraulic launch tower, and therefore the new launch site for the V7S was set up in only a couple minutes. The rocket was equipped with a GoPro camera to make on-board footage of the canard actuation. In the video it can be clearly seen that due to small deflection of the canards, the rocket first reaches a certain maximum roll rate, and then the canards are deflected into the opposite direction to reduce that initiated roll rate. The video footage confirms that active roll control has succeeded! flight. Positive canard deflection is used to damp out the roll rate. As soon as the rocket had landed, the SD card was recovered which contained the flight data. 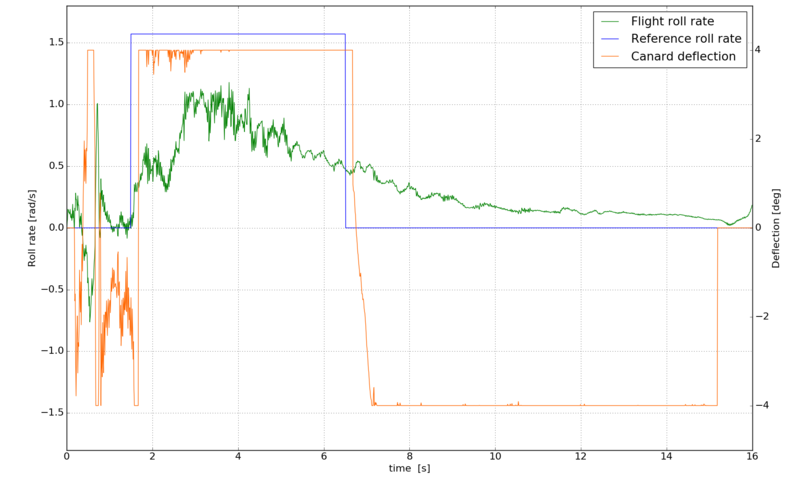 This data includes sensor output of the XSENS Mti-100 IMU (i.e. roll rates, accelerations), canard deflections, and state determination (i.e. velocity, altitude, orientation). 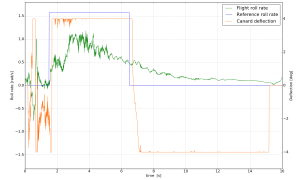 The flight data shows that the canards did deflect during flight and that it resulted in an increase and then decrease in roll rate. The flight data also shows that the damping of the roll rate was less quick than expected compared to the theoretical reference roll rate, since it took the entire flight to apogee (~15sec) to get the roll rate back to zero rad/s, as can be seen in the figure. The team concluded this was due to the small size of the canards, which in practice had a lower aerodynamic efficiency than the theoretical model predicted. The team can easily solve this by making the canards slightly bigger. The team proved that the modified stabilized CanSat launcher V7S is a reliable system for both passively stabilized data collection flights (ACT launch campaign 2015) as actively stabilized flights (ACT launch campaign 2016). The team will adapt the V7S and prepare it for a next launch to once more test the entire system. With the next stabilized launch, the team will gain more experience in flying advanced rocket systems, and collect more data to improve the flight control system and to guarantee that the V7S is ready for the next big step of the ACT: full stabilized launch to achieve maximum altitude. The ACT has demonstrated that DARE is capable of launching complex rockets with active stabilized control systems. This brings DARE into a new era of rocketry, and opens one of the final windows towards a safe and stabilized flight to space.